Most of us love a good mystery. Add intergenerational secrets to the mix and you’ve just upped the grip quotient. Add to that a medical procedure that’s the stuff of nightmares and horror movies, and you’ve got a potential hit. Janet Sternburg’s memoir White Matter (Hawthorne Books, 2014) takes this recipe and adds a layer of truth. 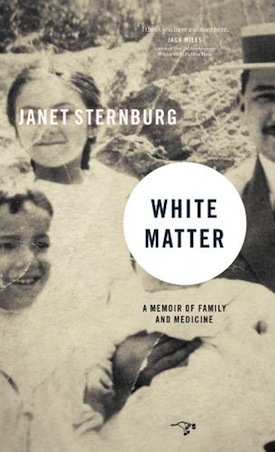 Born and raised in Boston, surrounded by members of her mother’s large Russian-Jewish family, Sternburg knew from an early age that her uncle and one of her aunts had undergone lobotomies, the form of neurosurgery that severs the “white matter” of the frontal lobe from the rest of the brain in the attempt to alleviate emotional and mental distress. Though the procedure went out of vogue years ago, it’s clearly a surgery that still has the power to fascinate. Just last week, People magazine featured the story of Rosemary Kennedy, who, more than 70 years ago, was subjected to a lobotomy in a decision apparently made by her father in the hopes that it would make her “less moody” and “docile.” The decision to have the young Rosemary undergo a lobotomy is referred to in the article as the Kennedy dynasty’s “darkest secret.” In a family famous for its “dark secrets,” that’s saying something, and it gives some idea of what the decision to lobotomize two out of six siblings must have meant to the Sternburg family legacy. Sternburg has written an engrossing tale about unraveling her family’s secrets, how she came to be a writer and what it is about the intersection between the personal and the medical that fascinates her most. The memoir lays bare a trove of family lore against a backdrop of shifting attitudes toward mental health and the dislocations of assimilation and generational trauma, as well as the changing roles of women. Sternburg has woven into her family chronicle the history of lobotomies and the contributions of notable figures in the world of neurobiology and psychiatry, some of whom came into close contact with her family. 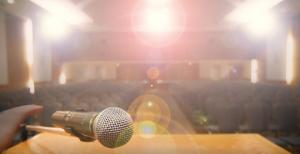 As a filmmaker and poet as well as a prose writer, she also references depictions of mental illness in the film and literary worlds, offering her writing additional depth and cultural relevance. While the decision to lobotomize two family members would today be unthinkable, we still face complex decisions about how to help family members struggling with mental illness in the face of stigma, and fears of inheritance. Sternburg’s family’s decisions to lobotomize are described as desperate attempts to keep the family together, particularly after her easily enraged grandfather abandons the family and her distraught grandmother quickly becomes overwhelmed. With the siblings left to care for their fractured family, decisions are made that have far-reaching – and disturbing – consequences. The book hasn’t received a lot of pick up, even though it was chosen as an “indie” book to read by Publishers Weekly, but it does deserve a readership. This story has resonance in an age in which the debate around the origins of mental health and the efficacy of various treatments – drugs versus talk therapy, for example – are as ongoing and fierce as they ever were. Aside from the ghoulishness of the lobotomies themselves, what I found most disturbing about Sternburg’s story is the lack of family intimacy. Her mother’s family was competitive and easily offended, and their early home was full of rage. They seemed to have little knowledge of how to take care of each other’s needs or emotions, yet they were “so entwined that to turn one’s attention elsewhere was tantamount to betrayal.” The family’s desire to reduce conflict and alleviate their siblings’ emotional and mental distress is understandable, even if it was misguided. 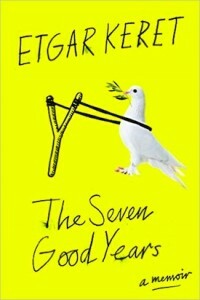 As much as Sternburg’s family mystery held my interest, it hasn’t had the staying power of The Seven Good Years (Granta Books, 2015), a new memoir by Israeli writer Etgar Keret. 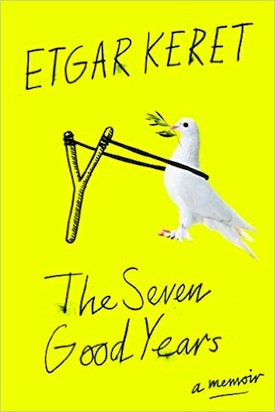 This collection of biographical essays begins with the birth of Keret’s son Lev (during a terrorist attack) and ends with the death of his father, from cancer, seven years later. Known for his collections of short fiction, this is Keret’s first piece of non-fiction, and I hope it’s nowhere near his last. Keret navigates these seven years (referencing the seven “fat” years of grain harvest in Joseph’s biblical dream) with his sharp insight, humor and compassion. The 36 essays are tight – spare and direct – and Keret creates a deep sense of intimacy with readers. He seems acutely aware of this effect: he has declined to publish this collection in Israel, or in Hebrew, calling it “too personal” for his home turf. The son of Holocaust survivors, Keret also has had to cope with intergenerational trauma, but it seems to have had a salutary effect on his inner life. In one essay, he’s unafraid to pretend to have a foot amputated just so he doesn’t have to hurt a stranger’s (a telemarketer’s!) feelings. He is acutely aware of other people’s perceptions, and his honesty is compelling, moving, electric and laugh-out-loud hilarious. Throughout, his attention is turned towards reducing the emotional friction around him and he recognizes the effect that living in Israel’s high-tension environment has on himself, his family and even on his interactions with strangers. He describes apprehensions about his newborn son’s future, relates intense discussions with his wife – the check and balance against his anxieties – and conspires with friends, siblings and others to make sense of his world. Through all of this, he worries about whether or not Lev will do his compulsory army service, about Iran getting the bomb, perceived and real moments of antisemitism, his relationship with the Holocaust, and when the next war might break out. Critics have called Keret’s writing self-deprecating, but I don’t connect with that reading of his work. I see his expressions of uncertainty and self-doubt as the building block of his empathy, the foundation of his profoundly funny and humane observations about his fellow human beings. As a bulwark against the intensity of existence, Keret seeks moments of “meditative disengagement from the world,” whether those moments are captured alone while flying from one writers festival to another, in being a first-time parent or in dreaming of a better world in which even the Iranian regime turns towards love. What makes Keret’s writing comforting is the importance he places on familial honesty, on sharing intimate space even with strangers, and on finding the good. It’s writing that makes me feel more alive. Basya Laye is a former editor of the Jewish Independent. Previous Previous post: Can terrorism deliver results?